I created this card for the CASology cue Up. My first reaction was to use balloons – but lots of folks were doing that so I decided to try something different. While thinking about what goes up – I came up with pulse rate! I don’t have a cool pulse-rate-line-thingy image, so I created this (and the sentiment) on the computer! The race car is stamped, cut-out, and popped-up. This entry was posted in cards, Waltzing Mouse Stamps and tagged gender-neutral, mailable, masculine by karen h. Bookmark the permalink. Can I just say that if I was a judge, this would be in the winner’s circle! I’m so in love with this!! So creative! I love your take on the cue card! A clean and simple card to be proud of! So glad you joined in on the fun at CASology this week! What a great way of take on the cue word, up! I’ve never thought about pulse rate, you are so creative! Thanks for sharing your card. such an orIginal idea Karen! And it looks so great for a boy card! LOVE IT!!! Just too clever!! LOVE IT!!! Clever, clever, clever! Love this original take on Up! Thanks so much for playing along with us at CASology this week! Super clever take on the cue word! Loe it! Thanks for playing along with CASology this week! what an absolutely BRILLIANT take on the cue word!! LOVE IT!!! thanks so much for playing along with CASology this week! 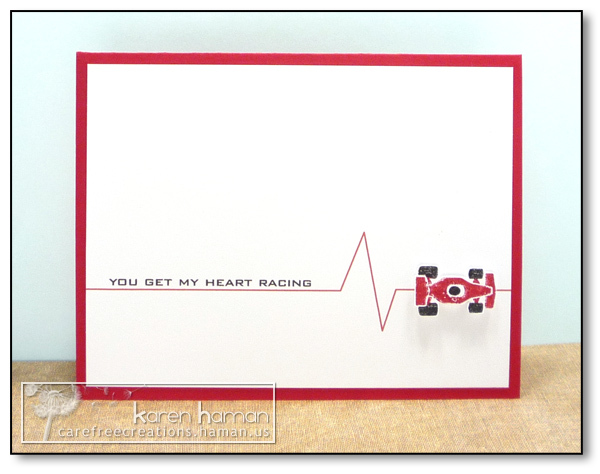 Karen, this card got MY pulse rate up! LOVE this clever take on the cue! So glad you joined us at CASology this week! This is an adorable card! Super cute idea!! LOVE IT! You were very clever to take this challenge in a different direction. Wonderful idea and execution. Absolute CAS perfection…it doesn’t get much better than THIS!!!! 🙂 What a creative take on this week’s cue word! L.O.V.E! congrats on your win. your card is FANTASTIC!!!! Congrats on your win! Your card is amazing – cleaver and perfect placement. Just marvelous!! Oh, squee, I’m so glad everybody agreed with me, Karen! This was SO the winner!! Congratulations! !